Conveniently located next to Fenway Park, there was no question where to eat prior to our Boston Red Sox game. Specializing in southern BBQ, Sweet Cheeks (@sweetcheeksQ) is owned by Chef Tiffani Faison. If her name sounds familiar, she was the runner up in the first season of Top Chef. On a side note, can you believe that the first season of the popular show aired almost 10 years ago? The décor of the large restaurant is exactly what you’d expect from a BBQ joint. It’s super casual with wood paneling and rustic wooden tables made from reclaimed bowling alley lanes. The four of us dropped by for lunch and we were seated right away. However, if you’re coming for dinner, reservations are highly recommended as the place often gets packed. But if you don’t have a reservation, don’t let that deter you as they save half their tables for walk-ins. To drink, we started out with a Scorpion Ball of Kentucky Rosie – Old Overholt rye, grapefruit, pineapple, mint, lemon, citrus bitters. You can get this in a single serving but since there were four of us, we thought this would be more fun. 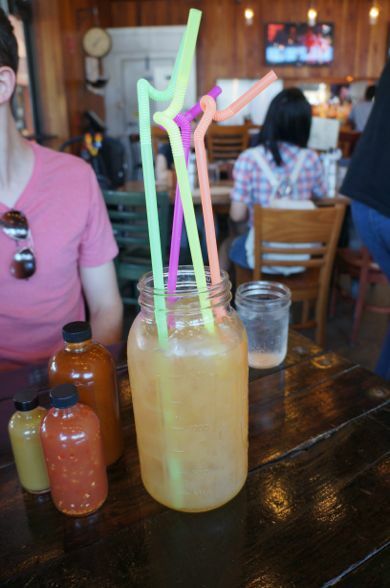 It was served in a giant mason jar with four neon straws. It was a very refreshing drink but still boozy. Just what we needed on a sweltering hot day! 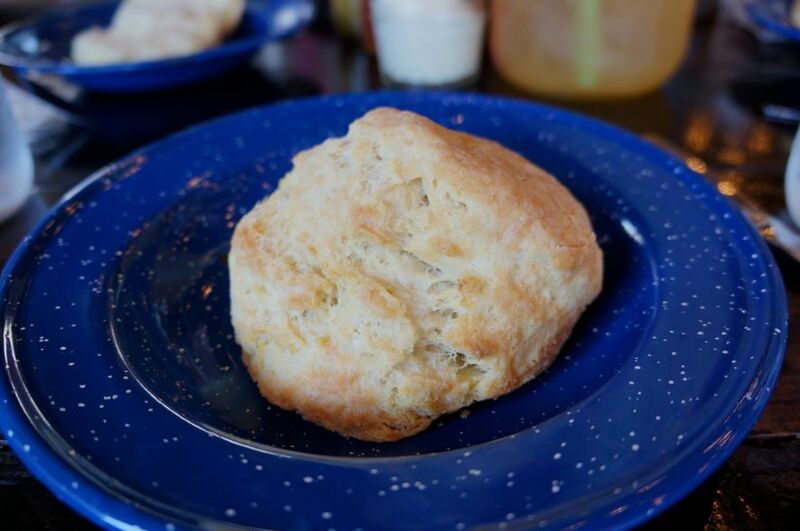 Don’t even think of coming to Sweet Cheeks without getting the Bucket o’ Biscuits – with honey butter ($10). I had high expectations since everyone says they make the best biscuits. After opening the restaurant, they had to purchase a dedicated oven just for the biscuits to keep up with demand. 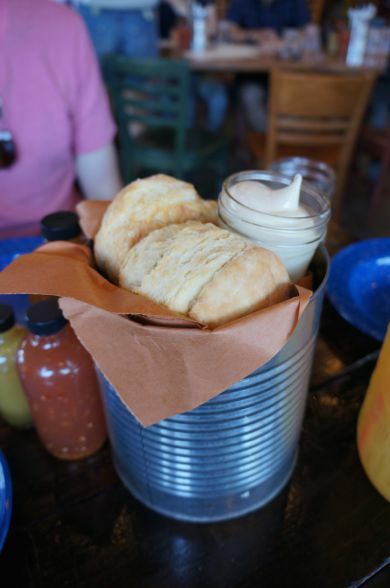 A bucket comes with four huge honkin’ biscuits. 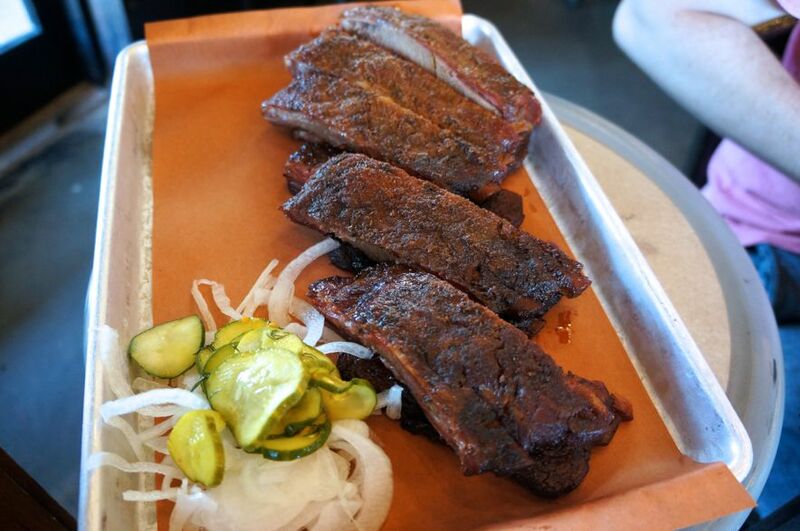 They were so big – I tried not to eat the entire thing to save room for the BBQ but I ended up devouring it. Served hot, these biscuits were perfectly buttery and flakey. Don’t forget to spread some of that whipped honey butter onto them. They add a nice bit of sweetness. This was definitely one of the highlights of the meal. 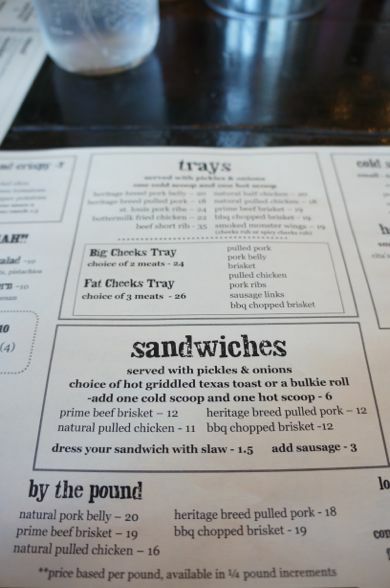 When it comes to ordering the meat, you can order it by the “tray” which includes your choice of meat, one hot scoop (including a broccoli cheese casserole and cheesy grits, to name a few), one cold scoop (including the usual suspects like coleslaw and potato salad), pickles and onions. 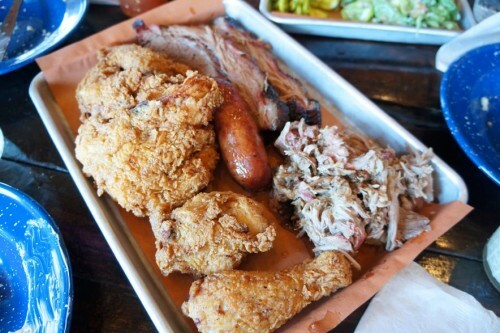 Meat options include: pork belly, pulled pork, ribs, fried chicken, short ribs, pulled chicken, brisket and wings. For those with a bigger appetite (or those in a group), the way to go is the “Big Cheeks Tray” (2 meats for $24) or the “Fat Cheeks Tray” (3 meats for $26). Sweet Cheeks also offers many of their meats in sandwich form and by the pound. Their BBQ is dry-rubbed with the sauce served on the side. Each table has 3 bottles of BBQ sauce: a North Carolina-style sauce (vinegary), a regular sweet and smoky sauce and a fruity spicy habanero. My preference was the regular sweet and smoky sauce. The first thing that I dug into was the Pulled Pork. It was pretty solid but it definitely needed some sauce. It was also very rich. I wouldn’t be able to eat a ton of it but luckily we were all sharing. My second bite consisted of the Beef Brisket. It had a nice bark, fell apart easily and had just the right amount of fattiness. Personally, I preferred this over the pulled pork. The third item we added to our Fat Cheeks tray was the Link. Honestly, this wouldn’t have been my choice but Mike was really pushing for it. I have to give him credit for this one as the link was really delicious! If all links at BBQ joints tasted this good, I wouldn’t be so hesitant to order them. We all had a hankering for some Fried Chicken ($17), so this was a no-brainer. The skin was nice and crisp while the meat retained most of its juices. But something was missing. It was good… just not amazing. Since we didn’t eat breakfast prior to our meal here, we definitely over-ordered. We were already quite full when a Full Slab of Pork Ribs ($31) arrived at our table. We were debating between a half or full rack but our stomachs made the decision for us. I always look forward to the ribs at a BBQ joint but unfortunately these were a letdown. They were way too salty for my liking and they were terribly dry. I think we barely finished half a rack. 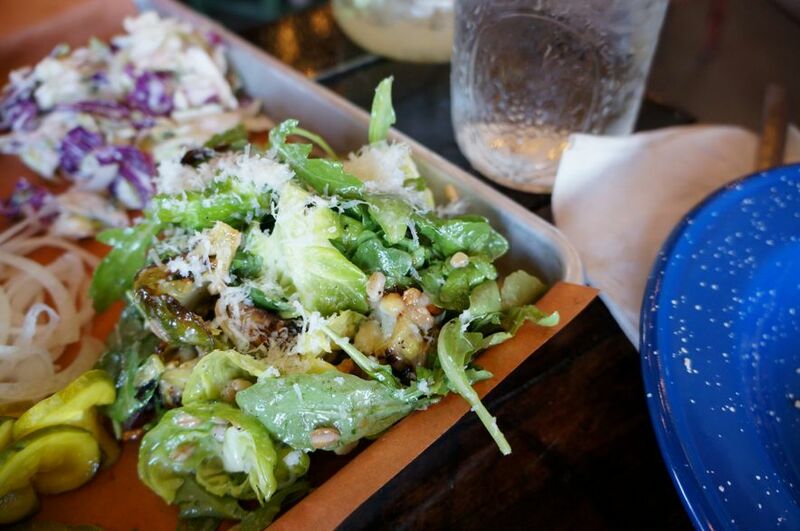 To supplement our meat-heavy meal, we ordered some much-needed sides. The surprising favourite was the Farm Salad. It consisted of arugula, faro, brussels sprouts, grapes and hazelnuts tossed in a light, refreshing vinaigrette. It was a delicious combination of ingredients that worked perfectly. 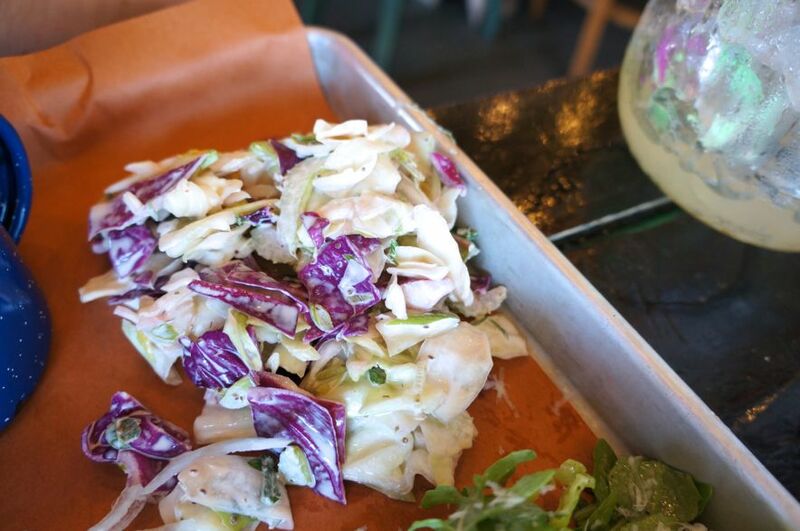 Who would’ve guessed that such a meat-centric restaurant would have such a stellar salad? Another side we ordered was a classic Coleslaw. It was chunky, fairly vinegary and all-in-all, a solid coleslaw but not particularly memorable. 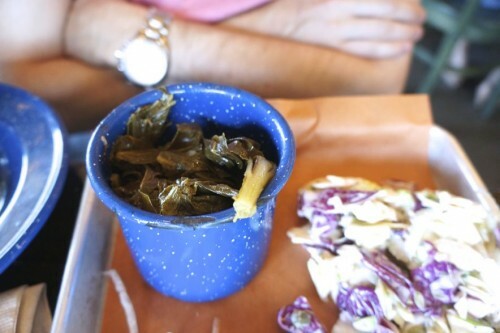 The last side we tried was the Collard Greens which was served in a cute little mug. The greens were cooked well – nice and tender without being too mushy. I’d happily order this again. Overall, I felt Sweet Cheeks was a little hit or miss. While they specialize in BBQ, I really wasn’t blown away by their meat offerings. The only thing I’d come back for is their biscuits and farm salad.